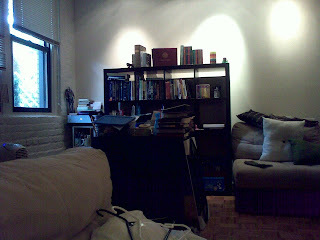 Our weekend was pretty uneventful, as Micah did a lot of homework and Lauren did some more job hunting and book reading! Yesterday we made cream cheese wantons and peanut buster parfait! Today Micah worked for about 9 hours, talked to a new friend on the phone about school, and did more homework! Thank you for your continued emails and prayers! We are trusting God everyday to take care of our needs and to sustain us through the week! Today Micah went in to work for a few hours - to top out his 24 hour/week work limit (a rule set by Moody). Every hour counts and definitely adds up! Micah had a TB test through school (it's required), then came home, brought flowers home to his beautiful bride, and started on homework! That's pretty much the extent of our day today! Micah had a buy a program called "Logos" for school. He installed that today and has been studying Greek with it. It's a really great program despite the high-dollar price tag it carries. It can access resources in seconds, compared the hours that it would take with print text. Well - that's it for today! We're still praying about Lauren finding a job! Nothing yet-but God will provide! Today marks our six months of marriage! And to celebrate...Micah went to work and then to class :) But this is part of why we are here in Chicago-to serve the Lord together as husband and wife. Micah has been working as many hours as he is allowed by the school (his job would love it if he could work even MORE hours) so that we can save up for next semester's tuition and also help alleviate our savings expenditure (which is currently paying for rent until Lauren finds a full-time job). God has continued to bless us as a couple and we trust that He will only continue to take care of us, provide for us financially, and help Micah through his seminary training at Moody. Micah had two classes tonight: the first is a non-credit "class" called SIL, or, Spiritual Integration Lab. This is where Micah meets with a few other guys to pray together and hold each other accountable. This class is under the direction of Professor McCord, who is Micah's Old Testament professor and who also takes students to Israel in the summer (something Micah is also praying about). In Micah's SIL he met Paul, who is our post office clerk just down the road! Every time we walk to the post office on Irving, there Paul is helping people ship packages and mail! It was pretty exciting to see someone at Moody that we semi-knew, and he's also there to learn and to further God's kingdom! What a small world! Even in Chicago! After SIL, Micah had his O.T. Literature and Themes class with Prof. McCord. It sounds like Micah is really going to enjoy this class. The class has a "contracted" grade policy, so Micah can decide how much (or how little) effort he wants to put into the class in order to get a certain grade. Of course, knowing him, he will probably push himself to shoot for an "A" in the class. It was encouraging to hear that grades don't really matter in the long run in seminary. It's what you learn, absorb, and can then use to teach and disciple others that really matter. Well - that's about it for today! Micah has a LOT of studying ahead of him (mostly Greek), so please pray that he is able to find a healthy balance of time (Lauren, school, work, and leisure). Also please keep praying that Lauren will be offered a full-time job soon that she would enjoy taking. It would be a blessing to have the security of a steady income that can pay bills, give Micah health insurance (which he currently doesn't have in order to save money), and add to our savings! Well the title of this blog says it all! Today was Micah's first day of classes! Micah worked early this morning again until his first class at 2pm - "Practice of Ministry." The professor is very personable, amiable, and godly! This is going to be a very enjoyable class (though still a lot of work) with a great community! The second class Micah had was Greek Exegesis I with Dr. Woodall. He is also Micah's professor for Hermeneutics online. Greek I is probably going to be the most challenging for Micah, but is also going to be a fun environment to learn in (and another solid professor who cares for the students and aims to help develop their skills for the missions field). There is a very big contrast in the level of attention these professors have for their students compared to what Micah was used to experiencing at the University of Minnesota! He is very happy for the change of pace! Lauren had an interview today with a nanny agency, and is also still waiting to hear from Moody on her application for a job there as well. We are praying that God grants her a full-time job soon so that our entire savings aren't spent before the end of the semester! God WILL provide though! We just have to continue to trust in Him! Happy birthday to Micah's Uncle Bernie! We love you and pray God's blessings over you and your family! May He continue to provide you with good health and add to your days many many more years so that you can continue to serve Him in this life! Today is my Uncle Bruce's birthday, my friend Jim's birthday (80 years old and still working at my former job at DRC!!! ), and my mother-in-law's birthday as well! I (Micah) worked early this morning at school, and pretty much just worked all day! Nothing too exciting to talk about (except that I like my job)! I took care of some more school stuff today as well, and then came home to my beautiful wife Lauren! She made calzones for dinner (from scratch of course)! The rest of the night was spend studying! I'm going to have to do a lot more of that after my classes tomorrow and Thursday! Today was my (Micah's) first day at school! I actually just had orientation today, but it was a full-day none-the-less. I arrived at Moody around 8am, met some other students, and was introduced to the faculty. It was great to finally put a face to all of the names! The new Moody president also seems to be a great guy! There weren't too many new students, and only around a dozen in the M.div program, but that will make for a good community of friends I imagine! We were able to eat deep dish (Chicago) pizza with the professors as well! It was a good day to get to know some more people and to get a feel for how everything works! We are now praying that Lauren will find a full-time job! She has an interview with a nanny agency this Wednesday. Please pray that this goes well, and if it's God's will, that she will find a job through this organization. There is also a Moody job that she has applied to that has not been filled either! So we are praying about that as well! Love you all! Thanks so much for your prayers and encouragement! Back to the Windy City! It wasn't our complete intentions, but we all ended up sleeping in....yep....we missed church. The day before completely wore us out, and we also knew that JB and Katie had a long drive home ahead of them. Praise God though, we were able to regain our energy once again, and had yet another exciting day together as friends! After another fabulous breakfast (consisting of cereal, leftover egg-bake, and yummy, cheesy scrambled eggs), we walked down our block to visit a few open houses! Our first stop was just down the street - to a 5-bedroom, 5.5 bathroom house! It was INCREDIBLE! We didn't realize how large that house actually was until we went inside! The Realtor was quite friendly, and we had a fun time exploring the ins and outs of this place! Let's not mention the fact that it was 2.25 million bucks - but hey - split 5 ways and we might have something (Lydia and Charles, are you interested in going-in?!)! The next house we looked at was just further down the street and over a block. It was a little smaller, but still fun to explore! The third house was...well it wasn't really a house! It was the middle level of a tri-plex. Not very fun, and the Realtor was pretty scammy. Oh well! We just want to buy the first place! After our excursion in Wrigleyville we drove back downtown! This time we hit up Portillo's for lunch! Portillo's is famous for their Chicago hot-dogs and Italian beef sandwiches! JB and Katie graciously treated us and we are entirely thankful! After our elevator ride and sight-seeing, Jon and Katie treated us again! This time to ice-cream at Ghirardelli! We ate the most amazing ice-cream! Ice cream is always good, but just try it from this place and you'll see what you've been missing out on all along! We stopped in the Hershey's store across the street as well - but it just didn't compare to the goodness of the ice cream and chocolate we just recently consumed! The time finally came to say goodbye. We drove back our place, spent some more time talking, reminiscing, and joking around. Then...as quick as they had come....they had left. Thank you guys for such a wonderful time this past weekend! We will definitely post pictures as soon as we have them available to post! Stay tuned! Oh! After JB and Katie left, we wept and sulked for hours on end. We decided to drown our misery by walking to another park nearby to watch The Goonies play in the evening. Chicago's "movie in the park" idea is pretty great! It would be cool if more city's capitalized on this idea as well! And this concludes our fun and fantastic weekend with JB and Katie! A Day in the City! We all slept in today - so that we might have enough energy for this weekend! Lauren cooked an amazing egg-bake (using the Camplin recipe) for breakfast! After going over a rough layout of our plans for the day, we took off! Our first destination was a farmer's market just a few blocks from our apartment (we walked there of course). It was fun to see and Micah bought some fresh sweet corn ("it tastes just like fruit")! Lauren gave Micah a hard time about the corn, since all sweet corn has a very fresh taste when eaten raw (only many people don't know that and overcook them)! Our next stop was downtown! We piled in the car, parked at Moody Bible, and spent the rest of the day on our feet downtown! We walked a good 10 miles today! We walked down to the Planetarium, where we were able to get in for free, thanks to a library pass that Lauren had acquired! The exhibits were fun to walk through, and we learned a lot (go figure)! We walked through Millennium Park, to Buckingham Fountain, and also had lunch at Giordano's! The stuffed pizza was delicious! By the end of the afternoon we were beat! We drove back to our place in the evening, took a nap, then walked to a nearby park to watch a movie called Coraline, a clay-animation movie! It was weird, but entertaining none-the-less! The weather was perfect today for all of our adventures! Today was the day that Jon and Katie Brown came to visit us! Micah worked another long day (another 9.5 hours), then came home so we could make preparations! We cleaned the apartment, organized everything, set up the Aerobed (an elevated and high-tech air mattress), and Lauren cooked and planned for our weekend together! The time finally came when JB and Katie arrived to our place! It was about 1am and we were overjoyed to see them! We ended up talking and catching up for a good hour before we hit the sack. This is going to be a fantastic weekend! 1st Day on the Job!! Today Micah started his first day at his job at Moody! He works for DRM - the Donation department at MBI (Moody Bible Institute). The day was long (9.5 hours of work), but he learned a lot and made several new friends! After work, we had a fabulous dinner (made by Chef Lauren), then drove to western Chicago (DeKalb area to be more specific) in order to buy an air-bed that we found on Craig's List. We want JB and Katie's stay to be as comfortable as possible, and we were blessed to find an Aerobed for the price that we did! It's even a queen size! Score! Today Micah went in to work for his "probation" period (it's a weird term I know) to see if he enjoyed the work involved in this department. He was supposed to go back again tomorrow, but they offered him a job on the spot today! He called his wife (good move) and made sure it was ok, then signed the papers! He starts his job TOMORROW MORNING at 7am! Pray that Micah learns everything quickly, is able to glorify God at the new work-place, and is able to balance school, work, and family in a healthy manner. Lauren is still looking for a full-time job. She has applications out all around town (including Moody)! Please pray that God brings the right job to her at the right time (hopefully soon)! Lauren made a DELICIOUS potato and gravy dinner tonight (also known as SOS in the military). It was superb! It poured outside this evening. Lauren was at the library when it started raining, so Micah walked over with the umbrella to surprise her and walk her home (although the umbrella semi-broke in the process)! Micah went in for another interview today. This position was for a data entry and materials processing job. This particular position is in Moody's Donor department - where all of the donations to Moody (school, radio, magazine, etc.) are processed. The tests and interview went well. Micah had four tests: a typing test (he got a 55 wmp average on the first try), a math test, a word test, and an excel spreadsheet test! As soon as he got home from the interview he was called up from the same place and they wanted him to come back the following day (tomorrow) to try out the job first-hand to see if he liked it (and if they would like him). He goes in tomorrow at 9am! Well - that's about it as far as news is concerned! Jon and Katie Brown are coming to visit us this weekend! We are VERY excited to see them and host their stay! Today was Micah's first interview of all time! Lauren told Micah that he's fortunate to have gotten so far in life without having to deal with interviews. Micah's interview went very well today and thinks his chances are good for getting it. Praise God! He's competing with 11 other people, but there are 3 positions open. Micah applied for another job at Moody today and already has a "test" and and interview tomorrow at 1:30, so please pray for that. Lauren baked again today - this time it was braided sweet bread. Since half of it is gone already, she's guessing it must be good. Penny is enjoying being so close to the kitchen these days. She sits next to Micah or Lauren on the stool and cuddles against us and licks our elbows begging for food. It's such a cute little show it's hard to resist. Penny has been getting plenty of people food lately. Lucky gal! We went to church today and recognized a lot of people from yesterday's block party! A graduating seminarian gave the sermon this morning! We really enjoy this church--the community! We also left with from fresh veggies from the church garden! Lauren made a REALLY amazing chicken noodle soup (noodles made from scratch)! I can't begin to tell you how amazing she is! We read books during the afternoon: Lauren finished "The Hobbit" while Micah is finishing up "Orthodoxy" by G.K. Chesterton! ps. don't forget to pray for Micah's interview, tomorrow (Monday) at 2pm! Micah wanted to eat them ALL (but he didn't)! Another joyous day to write about! Lauren and I volunteered to help set-up for a block party this morning. Of course, the block party was just down the block, and the volunteer efforts were in conjunction with our neighborhood church! The party was fun! We met a lot of people from church, ate some good food, and really had a fun time fellowshipping with our fellow neighbors. There was an Air and Water Show in Chicago today, so we saw (and HEARD) many low flying planes and jets over our heads throughout the day! After the party we took a quick nap, then decided to go see the Grant Park Orchestra play Beethoven's 9th Symphony (for FREE) at Millennium Park downtown! The concert started at 7:30pm, so we decided to leave at 6pm. 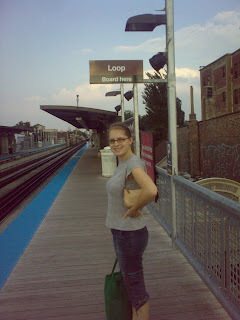 We took the train for the first time - which was a bit spendy (2.25 one way per person = $9 total round-trip!). 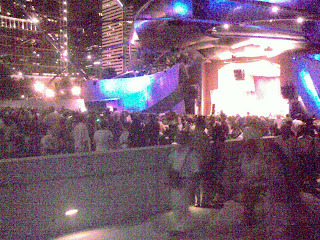 Well when we got there it was PACKED! THOUSANDS of people filled the chairs towards the front, and the huge lawn was covered with people, blankets, food - it was a party! We were not able to find a place where we could comfortably see the band, so we decided to lean against a railway with our blanket and enjoyed the 70 minute concert! It was pretty exciting! Chicago has so much to offer and we are so blessed to be in the heart of it all! Our first time on the rail-way! Thousands of people at the park! OK - so we can't just say we're glad it's the weekend since it's been "the weekend" ever since we moved, but we are sure happy for the time we have been able to spend together while not having jobs! We trust that God will provide jobs for us at the best time, so we have decided to just enjoy every moment that we don't have obligations to a particular job! We can spend all of this time together! We woke up ("wow, good job"), walked to the post office to mail a textbook we sold (believe it or not, it really does pay to resell those books), and walked around our neighborhood a bit. When we arrived back to our place we got the mail and discovered a card from our Aunt and Uncle in California! It was so great to hear from them - and it brought smiles to both our faces! We also received a wonderful card from Grandma Sonia as well! We are so very blessed with the family God has given us! Micah met one of our neighbors today: Jesse - nice fellow - musician who just returned to Chicago from being on tour. That's about it for today! Micah's brother Jacob came home this evening! Welcome home! He called and talked to us for a little while last night - that was great! It is such a good feeling to know that people are thinking of you and care for you, even when you haven't seen or spoke to them in some time. Such was the feeling today. We were very much blessed to receive not one, but TWO care packages from Fed-Ex this very morning! Inside the first box contained a plethora of home-care goodies - from super-glue, to dish soap, to an extension cord (which was much needed by the way)! The second box contained an entire meal (actually more like three meals) packed inside of a colander (which Lauren absolutely loves)! See the slide-show below for pictures of our surprise gifts! All this in thanks to Mr. and Mrs. J. - our dear friends at home in Andover. We are so grateful to you both for your love and generosity! This was such an exciting beginning to our day! We spent the rest of the day trying to hunt down more job opportunities. Micah still has his interview on Monday (at 2pm), while Lauren is waiting to hear back from a job she applied to at Moody (as well as several other jobs in the neighborhood)! Please keep us both in your prayers! We hunted down the last DVD of the BBC series: Bleak House - a story written by Charles Dickens. It was a fantastic series and we both recommend it as a very good series to watch! We also had a romantic candle-light dinner this evening, with the meal from the care package! It was a wonderful evening. We had plenty left for left-overs and even some extra goodies for another meal! This day was full of fun and surprises! It began with us waking up and eating breakfast! Now if that wasn't excitement enough, minutes after we finished our delicious bowl of Rice Krispies, the door buzzer sounded! Now who would be buzzing for US on this lovely morning?! We don't know many people yet! It turned out to be Fed-Ex, with a care package! Micah was so full of excitement as we opened the box! It turns out the gift box was from our friends Mr. and Mrs. (or "Mom" as Micah says) Johansen! They sent us a package with games, popcorn, and candy! Enough candy to keep Micah's energy from... virtually never ceasing! We are so very grateful to you both for this lovely package! We can't wait to meet more people and have a few rounds of Yahtzee and Uno together! Later today Lauren went to the library again to use the internet and apply for jobs. We are both still praying that God will soon bless us both with steady income to pay our bills. Micah still has an interview on Monday at 2pm with Moody. Please be in prayer for him. Lauren and Micah drove to a different library to rent the 2nd part of the BBC series "Bleak House" by Charles Dickens. Neither Micah nor Lauren has read the book or seen the film, but it has been most exciting to watch! For dinner, Lauren cooked up a most delicious beef stroganoff and made homemade noodles for the first time! The last time Micah had stroganoff was when he and his buddy Caleb tried cooking it up a couple years back! Good memories! That was our delightful day! Thank you again Johansen's for the care package! We will be playing games late into the night this evening! Aw, such a lovely sun today! Almost TOO warm! But praise God for the sun! This morning we went to Kohl's to purchase a tablecloth and some other necessities for our place. God was gracious to us, and we didn't have to spend a dime, thanks to our gift cards from our wedding! Later in the evening, Lauren cooked up one of Micah's favorite meals: grilled cheese sandwich, a fresh salad, and tomato soup! And this wasn't just any grilled cheese, it had swiss cheese, honey, a little basil, and a slice of tomato! It doesn't get much better than that! The rest of the evening was spent thinking about how amazing that dinner was, and how wonderful of a wife Lauren is to Micah! I think she's ready to get out of the house though and get a full-time job! After talking about it, we decided it is definitely not something to be anxious about, but rather something to wait on the Lord for. We have been diligent in searching for jobs, so we will enjoy this freedom from the normal lifestyle of work until God grants us such an opportunity to work again! God has continued to shower us with more blessings today! Is there no end to His abundant goodness, care, and love? We spent a majority of our day talking, planning, and trying to figure out how routines will go and how things will work around the house. Actually...that sounds like we did something with structure! We REALLY mainly laid around and talked about things we could do around the city for fun! We found out that several parks play free movies almost nightly throughout the month of August! We planned a couple date nights for a couple movies we wanted to see, Lauren went to the library again to use the free wi-fi, and I worked on more Army stuff. Sounds like things are moving forward still with the Army! A little slower that I would like, but everything is in God's hands and He alone will direct that route! Lauren wanted to make cheesecake tonight, and I needed to buy some cards, so we walked to CVS to buy a gram cracker pie crust. Then we walked over to Hallmark to get a couple cards (we wish Ariel was working at this one...) then came back home - only to find out that the cheesecake box CAME with gram cracker crumbly things! haha! Oh well! MORE GOOD NEWS - MICAH HAS AN INTERVIEW NEXT MONDAY AT 2PM at MOODY! He applied for the "document control clerk" part-time position, and has his first interview next week! We know there is more than one person being interviewed, since he emailed for the first interview slot and they said it was already full! So please keep him in your constant prayers, that the Lord will bless him with this job (and if not, then another one soon)! Lauren is still looking around, but has applied to several places around town (including a full-time position at Moody as a "liaison"). If Lauren is blessed with a full-time job at Moody, that would also mean that Micah's tuition would be HALF-OFF! So - LOTS of things to be in prayer for! Thank you so much for lifting these things up in prayer! We really appreciate it! Well - that's about it for today! Thank you for all of the wonderful emails, comments, prayers, encouragement, and care packages coming our way! We are SO very blessed to have you as friends and family. We always seem to start out by saying out great the day has been! This blog won't be any different! We woke up, planning on going to Moody Church, but started to run a little behind schedule. We decided instead to go back to the small church we had attended last week - just down the block! It was probably a God-thing that we went back! We met some of the same people we did the previous week, made more acquaintances, and we were even invited to lunch at someone's house after church! We signed up to assist with next weekend's block party as well! We are already becoming involved with a church that we just started going to - praise God that we don't have to do any "church hopping" here in Chicago. It seems He has blessed us with a church right down the road! After church we went up to see Lauren's relatives in Trevor, WI for the rest of the day (we had to postpone the lunch date with our new church friend). We had such a wonderful time up at the Ericksons'. Tammy made another wonderful meal (as usual), and we enjoyed spending time with the family, playing cards, catching up, and meeting their new puppy Dudley! A crazy storm passed through and we got a couple good pictures of the clouds! See below! All in all - a "great" day! The Lord has truly blessed us! We both need to find jobs now! But we know God will take care of that in His time! What a lovely blessing it was to have our dear friend Amy Brown come visit us today! Amy was in town visiting some friends, and she decided to take them all to our new place to say hello! Lauren and I both relaxed for a majority of the day. Lauren went to library to use the wi-fi and to rent a couple movies (one is in Hebrew), while I (Micah) cleaned the apartment. OH! Did I mention that Lauren made powdered sugar from scratch? I didn't even know that was creatable in the kitchen! She used that for the cake she made a couple days ago! So, Lauren rented this BBC movie: Charles Dickens' "Bleak House" - we thought it was just a couple hours long, only to find out that it is about 8 HOURS long, and we have the first out of THREE DVDS! haha! So far though it is a well-done movie. See pictures below! And a video below that! Click image below to see a video! Not much to say about today! No pictures either! It was a rainy day! We walked to Trader Joe's to pick up some ingredients for a meal, stopped at Crate and Barrel 2 (pretty expensive place) and then came home! Lauren cooked up a meal fit for a king, and we were happy all day! It's been a real blessing hearing from our family and friends through this blog! We love you all! Lauren went for a walk today to try to find free internet. She started out at a Starbucks, but they charge $4 for every 2 hours! Then she tried a local coffee shop (The Red Eye) and lo and behold - free wi-fi! But it was SLLLLLLLOW! She learned that the library was only .6 miles away, so she went there afterwards and decided that was THE place to go for free internet (no time limit)! While all of this was taking place, Micah went to Sears to pick up some bunny ears for our TV (it's digital but still requires an antenna). He also picked up a fireproof/waterproof safe for our important documents (just to be "safe"...lol)! 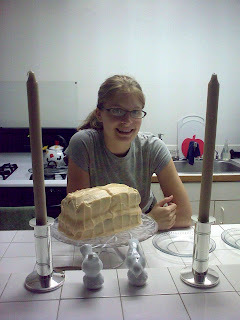 Lauren made a cake that evening, and we cuddled up and watched Singin' in the Rain late that night. It was a fun day! We would LOVE to hear from our family and friends via snail mail! I think we can say that we are officially unpacked today! Of course there are pictures to hang here and there, and little adjustments being made - but we're pretty much done! Check out the slideshow to see what we've done! Today we slept in, had breakfast, went to Kohl's, Target, CVS, and Jewel-Osco (like a Cub Foods), then back home! We got a new stand for our TV and DVDs, and we finished unpacking the rest of our stuff!! We are still looking for jobs! Please keep us in your prayers! Lauren decided against going to the interview since she wasn't sure exactly what the job entailed, and it was also in the south part of Chicago as well. So please pray she is able to find something else! I am also looking for a part-time job as well! I check Moody's website everyday hoping to find something! Another fanTASTIC day in the sunny city! We continued to unpack and organize and finally things are looking a LOT more homey! 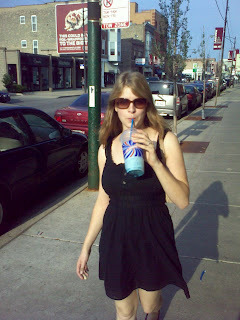 We enjoyed a nice long walk to 7-11, got a slurpie (brought back old childhood memories for Lauren), rented a Redbox movie, and just relaxed later in the evening. Penny our cat loves the windows and LOVES to hop up onto our loft bed as well (naughty cat)! Tomorrow (Wednesday) is Lauren's interview in the evening. Please pray for her - that God gives her the right words to say, the confidence to say them, and that the interviewers will see just how sweet and amazing she truly is! Today was very eventful! We spent more of our day unpacking more goodies and running errands. We began our morning with a quick trip to Sears - to take back a tool we didn't use for our loft. This Sears was located only a mile away, and we learned that it was the oldest Sears in the country! We stopped by the Post Office to mail a textbook that Lauren sold, then went back home for lunch (where Lauren cooked up a wonderful pot roast stew from the crock pot we got from Grandma Camplin)! Hey! We're all moved in! Thanks to both of our families for helping us pack, coming with us to Chicago, and helping us get settled in the big city! Here are a few pics (and one video - be sure to click the video to watch it) of our new place! More to come! CLICK IMAGE BELOW TO VIEW THE VIDEO!